Carnegie Deli Says It Is Closing Down Its Landmark NYC Restaurant : The Two-Way As news of the closing rippled far beyond the deli's home turf in Manhattan Friday, hundreds of people responded with sadness and disbelief. A pastrami sandwich sits on the service counter at the Carnegie Deli in New York. The deli is closing at the end of 2016. 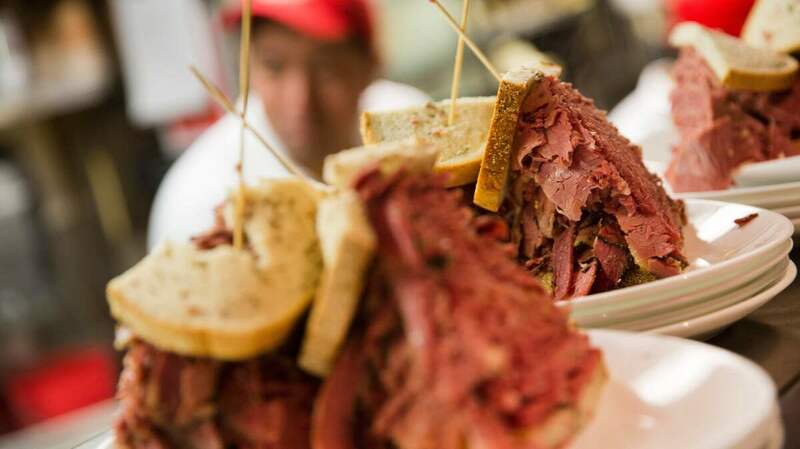 It's one of the most famous delis in the U.S., if not the world; its food has been called "nearly orgasmic" — but now comes word that New York's famed Carnegie Delicatessen will be closing its doors at the end of 2016. "We have very sad news," reads a message from the restaurant on its Facebook page. "This is probably one of the most difficult decisions we have had to make. Carnegie Deli New York (845 7th Avenue) will close on December 31, 2016." The deli first opened in 1937 — meaning that it will close just shy of its 80th anniversary. The deli's current owner says she wants to retire from running the restaurant. The news also means that Carnegie's fans now have three months to get a final taste of the deli's trademark pastrami and corned beef sandwiches — a combination of which, stacked high on rye, is known as "the Woody Allen." Carnegie's legacy, its owners say, will now live on through a family-owned meat processing facility and commercial bakery in New Jersey, along with a scattering of licensed locations around the U.S.
As news of the closing rippled far beyond the deli's home turf in Manhattan Friday, hundreds of people responded with sadness and disbelief. A large crowd lined up outside the restaurant's doors Friday, braving the rainy weather to get what could be their final taste of Carnegie's hot pastrami sandwich. One man responded to the deli's announcement by writing on Facebook, "Carnegie Deli played a real factor in my decision to move to NYC in the first place. Now you're going to take the easy way out? You're going to turn your back on us?" Carnegie's owner, Marian Harper Levine, "tearfully broke the news to 60 heartbroken employees on Friday morning," according to the New York Post. The newspaper quotes Levine, 65, saying, "At this stage of my life, the early mornings to late nights have taken a toll, along with my sleepless nights and grueling hours that come with operating a restaurant business." Levine, whose family has owned Carnegie since 1976, says she needs to get away from the restaurant — but on Facebook and elsewhere, fans asked why she couldn't simply sell the deli. "This just doesn't make sense," one commenter wrote. "I get that you want to move on, but let someone else run the deli then. If everyone loves it, why take it away from us? You're literally a part of the fabric of NYC." Of course, there are other beloved delis in New York — including Katz's, which opened in 1888. If you're in the mood to see more pastrami, member station WNYC has you covered, thanks to a short video about the deli from 2014.